Now it was on to the beach. After a short drive, we arrived in an area dominated by high rise hotels, malls and up-scale shops. We were no longer on a desert island but rather on one with tall trees flowering plants and landscaped lawns. A man-made tropical paradise. The driver dropped us off at a bus stop where we were met by someone from one of the local establishments. She said that she would lead us to the beach and explained that we were entitled to a beach chair and to a drink at a reduced price at her bar. We then followed her along a footpath between two of the hotels and onto the beach. Palm Beach is a pretty beach. Towering palm trees shade the white sand that runs up to the somewhat milky turquoise water. The beach has been extensively developed. It has bars, restaurants and places to purchase or rent just about everything beach-related. Much of the sand is covered with beach chairs and various other furniture. Most of it belongs to the glamorous hotels that neighbor the beach. Along the border between the hotels and the beach is a nicely paved path that essentially runs the length of this two-mile long beach. 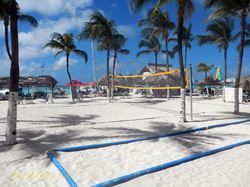 All of the beaches in Aruba are public. Thus, anyone can use any section of the beach even those areas that are covered by chairs belonging to the hotels. Of course, you cannot use a hotel's furniture or facilities without that hotel's permission. The various hotels have different policies regarding non-guest use of their furniture and facilities. We found the sun very intense here. Despite several applications of sun screen, there was still some burning. Nonetheless, we found Palm Beach enjoyable. As above, it is visually appealing. The sand has a nice texture and the water nice. It is busy but that makes it better for people-watching. While most of the people on our tour stayed on the beach throughout, some did go shopping. The Paseo Herencia Mall and the Palm Beach Plaza were across the street from the hotels near where the bus had dropped us off. They resemble up-market shopping complexes in the U.S.
As the hour designated by our driver drew near, the passengers began to assemble at the bus stop. This included two passengers who had missed the rendezvous time for an earlier Kukoo Kunuku bus. Inasmuch as our bus was full, they elected to take the local Aruba bus back into Oranjestad. Although the passengers were visibly tired from their day at the beach, our driver was able to rekindle the party spirit. Music played, shout outs occurred and we spun around another roundabout. Along the way, he pointed out Eagle Beach and a Dutch windmill that had been brought to the island. The return trip was much shorter than the outbound trip as the driver took the direct route back to the cruise terminal. We arrived back with the sun sinking low in the western sky. Still, Oranjestad was busy as the passengers from the three ships in port engaged in some last minute shopping.